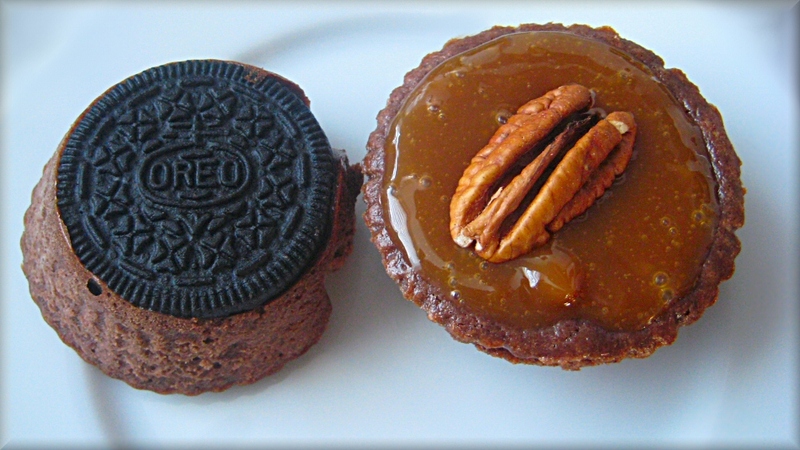 So, this idea is not original and has been done before - but I just wanted to make some too... they are quite yummy, and I added a top layer of caramel sauce and a pecan to top it off... cutesy, too! And I love the layers when you cut through it like this - looks like something that takes some time to make - but it's so quick to whip up. So, after making a batch with Oreo's - I decided to make some with mini stroopwafels.... and I'm not sure which I liked better... but I love - love - LOVE stroopwafels... 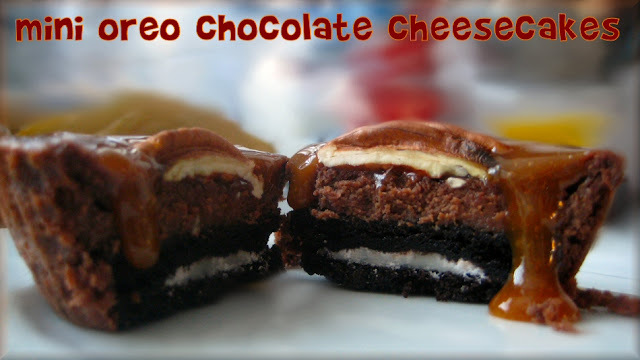 I could eat them everyday... and I have... not lately, though... I'm getting much better at disciplining myself - really I am! I know it doesn't look like much - it doesn't have that layers thing like the Oreo does... but stroopwafels are so very yummy! Just in case you haven't seen what I've done with stroopwafels before... let me redirect you to a previous post... Double-dipped Stroopwafels were divine. Also, my newest way to indulge in this bad but good cookie - is to spread a thin layer of chocolade pasta on it (such as Nutella). They are also great served up with some chocolate vla (pudding) and whipped cream. 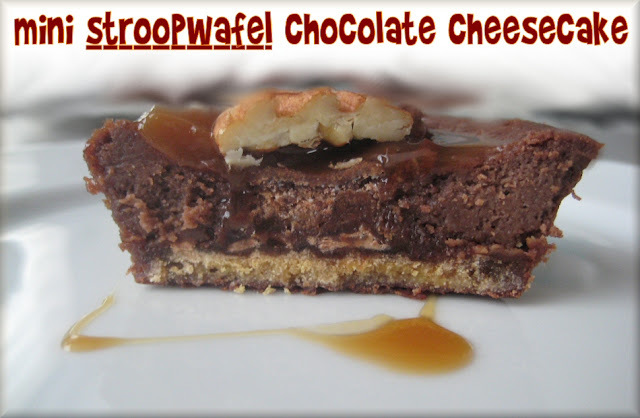 Stroopwafels and chocolate are friends - they go great together... even better than peas are carrots - yup yup! Step 1. Line muffin pan with silicone cupcake liners - these peel away easily from the finished product. Place one Oreo cookie or mini stroopwafel or other cookie of your choosing in the bottom of each liner. Set aside. Heat oven to 160-C or 325-F. Step 2. In a bowl, prepare chocolate cheesecake batter - beat together 1 package (8oz) cream cheese and 1/4 cup sugar, mix in 1 egg, 1/2 teaspoon vanilla and 3 ounces (about 1/3 cup) semi-sweet chocolate morsels, melted. Step 3. Divide batter among the cookie lined muffin holders or no more than 3/4 full. Cook in oven for 25 minutes. Cool before removing from pan. Chill. 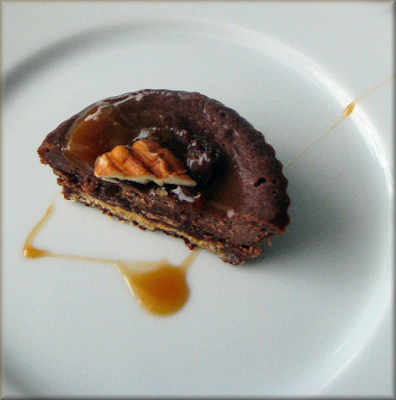 Top with caramel sauce and pecan half just before serving.